An unusual colour with a peach base full of copper glitters. And of course the name is very apt. The Big Bang Theory fans out there will get it. 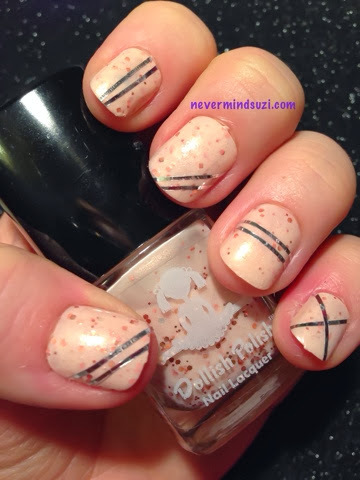 I've tried out some striping tape too that I got from BornPrettyStore, I got this in these fabulous value Lucky Bags here. Useful for making pretty designs, you can also do as I've done here BUT leave the tape a bit longer, paint over it with a contrasting colour and remove the tape, I'll do a design like this soon. And don't forget to check out Dolly's gorgeous polishes here. I'm such a huge fan of them (and I'm aiming for 100 to become one of Dolly's girls).